The killing of Atwar Bahjat, who rose to fame reporting from Iraq for both main Arabic satellite news networks, has shocked Arab journalistic circles. Gunmen kidnapped and killed her and two members of her crew near Samarra where they had gone to cover reaction to Wednesday's shrine bombing. 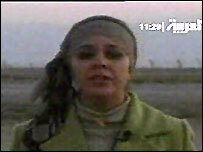 A member of the al-Arabiya TV team who escaped described how two gunmen showed up as they stood in a crowd of Iraqis. They dragged Bahjat and her colleagues away and shot them. Their bodies were found on the outskirts of Samarra, an area racked by sectarian violence since Wednesday's explosion that destroyed the revered Shia Muslim al-Askari shrine. A spokesman for al-Arabiya said Bahjat, an Iraqi citizen, was a Sunni Muslim. She was one of very few women to work as frontline conflict reporters for Arabic television. The 26-year-old had only recently moved to Saudi-owned al-Arabiya TV from the rival Qatari-owned station al-Jazeera. The Qatari station has been heavily criticised by US military and political leaders for its coverage in Iraq, including suggestions that correspondents had prior knowledge of insurgency attacks - a charge denied by al-Jazeera. Al-Arabiya said it lost contact with its team at 1500 GMT, shortly after nightfall. The three bullet-ridden bodies were found the following morning. The station has been showing the last report Bahjat filed - in fading light beside a road outside Samarra, close to where the team was kidnapped. They had been about to return to base in the northern city of Kirkuk when two gunmen drove up in a pick-up truck, al-Arabiya correspondent Ahmed al-Saleh reported on the morning news programme. "The two gunmen started firing their machine-guns in the air, which caused the people to panic and to run away," Saleh said. "One of them started shouting 'We want the anchorwoman'. Atwar was in the news van and shouted to the crowd to help her. "The crew tried to speak to the gunmen, but they snatched them and took them an unknown location." The correspondent described Bahjat as a "victim of truth; she loved her country and died because of her impartiality." The channel named the other dead team members as cameraman Adnan Khairallah and soundman Khaled Mohsen, who both worked for the local Wassan production company. 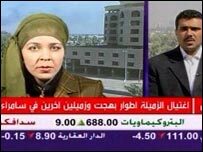 At least eight employees of al-Arabiya have died in Iraq since the 2003 US-led invasion, some of them killed by US forces and others by suspected militants. They are among more than 60 journalists who have fallen in the conflict, making Iraq one of the most deadly and hard-to-cover stories. In September 2004, al-Arabiya's Mazen al-Tumeizi was killed on camera in Baghdad when a US helicopter opened fire to destroy an abandoned US army vehicle that had been hit by an insurgency attack.